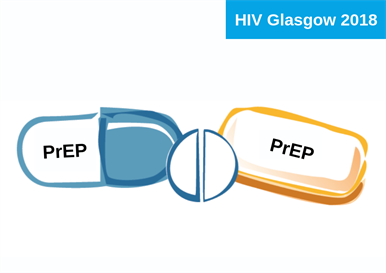 People buying generic PrEP (pre-exposure prophylaxis) online can be confident they are buying the real thing, according to research presented to the International Congress on Drug Therapy in HIV Infection (HIV Glasgow) today. Investigators in London tested the contents of branded Truvada and 13 generic samples of the tablet bought online. All contained the amounts of emtricitabine and tenofovir stated on the label. PrEP using tenofovir combined with emtricitabine can reduce the risk of infection with HIV by over 90%. However, the NHS in England provides only limited free access to PrEP, via the IMPACT trial. This means that many individuals who would potentially benefit from PrEP have resorted to purchasing generic versions of the therapy from online pharmacies. There is already some evidence that these individuals can have confidence in generic PrEP – a therapeutic drug monitoring study involving approximately 300 individuals using generic PrEP found plasma concentrations of emtricitabine and tenofovir above target levels. However, concern has been expressed in some quarters about the authenticity of generic PrEP purchased online. Investigators from Imperial College, PrEPster (a PrEP advocacy group) and Terrence Higgins Trust therefore tested the contents of generic PrEP from mainstream brands purchased from a range of online suppliers, measuring the amount of emtricitabine and tenofovir. A total of 14 samples were obtained, including branded Truvada and the generic products Tenvir-EM (Cipla), Ricovir-EM (Mylan), Tenof-EM (Hetero Healthcare), Teno-EM (GPO), Tavin-EM (Emcure) and Adco-Emtevir (Adcock Ingram). The online suppliers were Dynamix International, In House Pharmacy, Green Cross Pharmacy, United Pharmacy, All Day Chemist and Silom. The samples were bought directly from online suppliers and care was taken to ensure those placing the orders were not known to the online suppliers as PrEP activists. A fully validated assay was used to determine whether the samples contained the 200mg of emtricitabine and 300mg of tenofovir stated on the label. The scientist testing the samples was blinded to the origin of each sample. Branded Truvada contained 100% of the stated amounts of both drugs. The 13 generic samples contained between 97% and 104% of the claimed 200mg of emtricitabine and 94% to 105% of the stated amount of tenofovir. Ian Green, Chief Executive at Terrence Higgins Trust, commented: "These results clearly show that the PrEP being privately sourced online from the main suppliers is fit for purpose and therefore, when taken as prescribed, highly effective at preventing HIV. Understandably, those considering ordering PrEP online have some concerns about what they are buying and hopefully this will act as further reassurance. "But this doesn’t change the fact that NHS England must make PrEP routinely available to those who need it. It’s unacceptable that many trial sites on the IMPACT Trial are now unable to provide PrEP for gay and bisexual men as no-one should be denied a pill which can prevent HIV as we work toward reaching zero HIV transmissions in this country." Wang X et al. Generic tenofovir disoproxil fumarate and emtricitabine tablets obtained from the internet – are they what they say they are? International Congress on Drug Therapy in HIV Infection (HIV Glasgow), Glasgow, 2018, abstract P010.